The Conway Symphony Orchestra will present its Christmas concert at 7:30 p.m. Saturday, Dec. 8, at Reynolds Performance Hall at the University of Central Arkansas. The Conway Symphony Orchestra is bringing a classic Christmas back to Conway at 7:30 p.m. Saturday, Dec. 8, at Reynolds Performance Hall at the University of Central Arkansas. Suzanne has been a frequent soloist with the Arkansas Symphony Orchestra, and has performed with orchestras across the state as well as with the Lake Charles Messiah Orchestra, Opera Theater at Wildwood, New Orleans Opera Company and Memphis Vocal Arts Ensemble, with several appearances at the Arkansas Governor’s Mansion. Suzanne can be heard on the CD recording “Alan Hovhaness: Music for Horn, Voice and Strings” produced by Centaur Records, Inc. 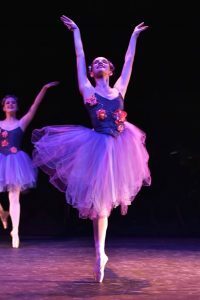 The Arkansas Festival Ballet will perform highlights from ‘The Nutcracker’ with all-new choreography, matched to their precision, beauty and passion. This family-favorite has become a beloved tradition with Central Arkansas families, and is the perfect way to celebrate with all generations. Tickets are $5 for children and students of any age with valid ID, and are $20, $30 and $38 for adults, with a special group rate of $15 for 10 or more. They are available at the Reynolds box office, 501.450.3265 or ConwaySymphony.org (adult tickets only online). The concert is underwritten by Conway Corporation, with additional guest artist support from Smith Ford, and hospitality support from Julie’s Sweet Shoppe. Families are also invited to join the CSO Guild from 6 to 7 p.m. for Nutcracker Sweets, held next to Reynolds at Brewer-Hegeman Conference Center. This special pre-concert event is $5 for children and free for accompanying adults, and offers an opportunity to meet the ballerinas and enjoy the story of “The Nutcracker,” plus cookies and craft activities. The event is great for parents, grandparents or anyone who wants to make memories with a special child in their life. Make reservations by calling 501.269.1066 or at ConwaySymphony.org, under Events. The Conway Symphony Orchestra brings professional concerts, exciting guest artists and high-quality music to the Central Arkansas community. For more information on concerts and other programs, visit ConwaySymphony.org or call 501.269.1066.